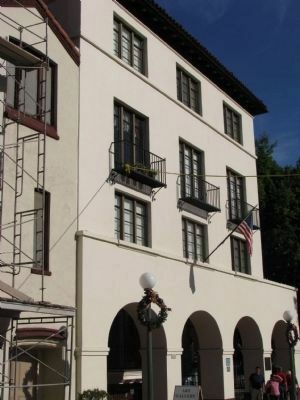 This building, located on the site of the Juan Sepulveda adobe, was designed as the United Methodist Church Conference Headquarters and the Plaza Community Center. 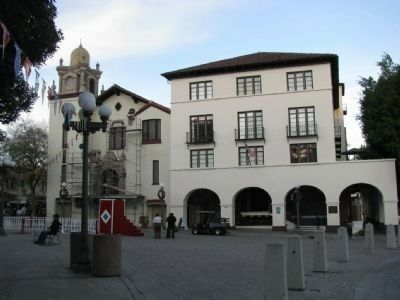 Today it serves as the Consulate-General of Mexico. 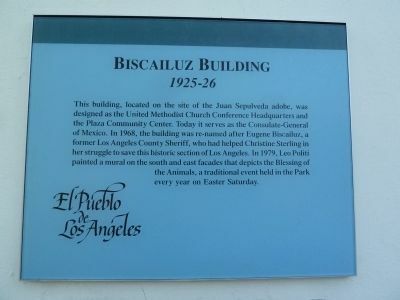 In 1968, the building was re-named after Eugene Biscailuz, a former Los Angeles County Sheriff, who had helped Christine Sterling in her struggle to save this historic section of Los Angeles. 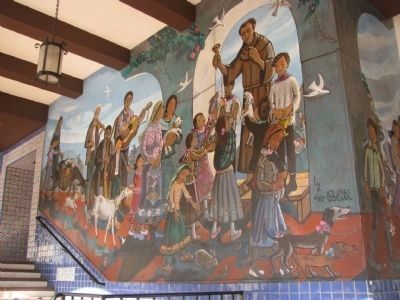 In 1979, Leo Politi painted a mural on the south and east faces that depicts the Blessing of the Animals, a traditional event held in the Park every year on Easter Saturday. Location. 34° 3.402′ N, 118° 14.288′ W. Marker is in Los Angeles, California, in Los Angeles County. Marker is on Marchessault Street just east of Olvera Street, on the right when traveling west. Touch for map. Marker is located on an arch of the building. 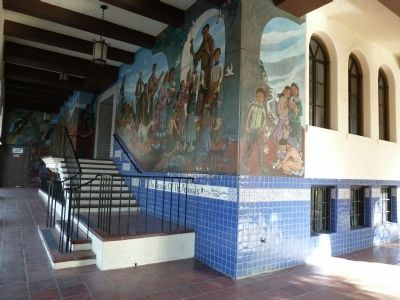 Marker is in this post office area: Los Angeles CA 90012, United States of America. Touch for directions. Marker is visible between the second and third arch from the right on the Biscailuz Building in the background. 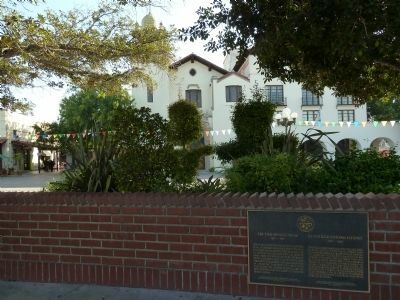 few steps from this marker); The Old Spanish Trail (within shouting distance of this marker); First Mayor of Los Angeles Under United States Rule (within shouting distance of this marker); Plaza Substation (within shouting distance of this marker); Los Angeles Plaza (within shouting distance of this marker); In Honor (within shouting distance of this marker); Latino Blood, American Hearts (within shouting distance of this marker). Touch for a list and map of all markers in Los Angeles. More. Search the internet for Biscailuz Building. Credits. This page was last revised on June 16, 2016. This page originally submitted on April 22, 2012, by Chris English of Phoenix, Arizona. This page has been viewed 531 times since then and 29 times this year. Photos: 1, 2, 3. submitted on April 22, 2012, by Chris English of Phoenix, Arizona. 4, 5, 6. submitted on March 1, 2013, by Denise Boose of Tehachapi, California. • Syd Whittle was the editor who published this page.